This lovely island is located on the coast of Maine about 15 miles south of Brunswick, Maine at the southern most end of Route 24. 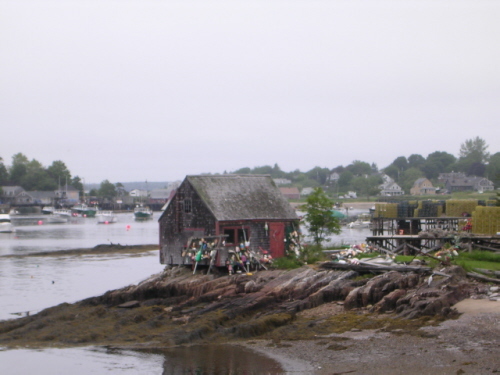 It is part of the Town of Harpswell. The island is almost 3 miles long and less than one mile wide. 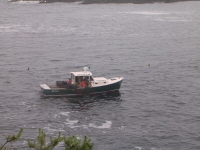 It is located about 50 miles from Portland, Maine. Farmers and fishermen settled the island in earlier days. It is not farmed much now although many fishermen still work live and work on the island. 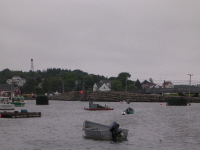 Many lobstermen still make a living on this island. In the late 1880's, with the advent of steamships, visitors would come from Portland for weekend trips. The island also saw its share of summer residents from more distant places such as Boston and New York. As a result, many boarding houses and cottages were built. The island has seen some name changes throughout time. The Abenaki Indians called the island Newwaggin. The first known settler was a man named Will Black and he lived on the island for many years. He eventually gained title to the island and the name of Will's Island came to be. He lost claim to the island to a man called Timothy Bailey (and his wife Hannah) through some illegal manipulation of the law on the part of the Bailey's. The island then became know as Bailey's Island and then later Bailey Island. Mackerel Cove. A nice view whether from the top of the hill on Route 24 or in the public parking spot at the head of the cove. Not many yachts here - just working fishing vessels. (see picture at right). This store is found at the very end of Bailey Island. This is a fairly large gift shop with all sorts of goodies to take home for souvenirs. The fudge is especially good and reasonably priced. There is a good view of the ocean and offshore islands, ample parking (unless it is the height of the tourist season), and a small beach to sit on. 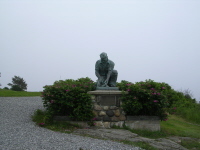 Bronze Fisherman's Statue. Located at the southern most tip of the island. A Bailey Island fisherman was immortalized in bronze as a dedication to all men who make their living from the sea. (see photo at right). Cribstone Bridge. This unique bridge was built in the 1920's and joined Orr's Island and Bailey Island - spanning Will's Gut. It was made of granite stone slabs quarried in Yarmouth and Pownal, Maine. It is the only bridge like it in the world and is now a historical site. A newer bridge has since replaced it. (see the picture at right). Jaquish Island. Named for an earlier settler who led men from Maine in the French and Indian War. It is now home to a single dwelling. Can be seen off the southern tip of Bailey Island. (see picture at right). Little Harbor. 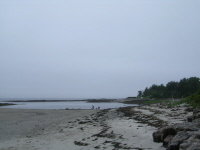 Located on the southeastern shoreline of Bailey Island. Hard to get to as it is on a small side road coming off Route 24. A very nice cove to visit. Waves crashing into the cliffs provide a lovely view. There is an inn here that looks like a nice place to stay. Lowell's Cove. 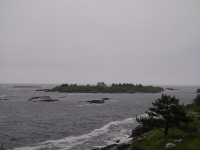 Located on the western edge of Bailey Island. The Giants Stairs Trail. Located on the eastern shoreline. Take Route 24, go east on Washington Avenue. Parking at the Episcopal Chapel is limited and prohibited on Sunday mornings. From there walk down Ocean Street to the end to find the entrance to the trail. 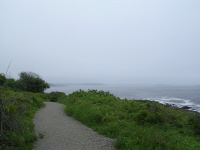 For more information on this lovely ocean side walking path visit Giant's Stairs Trail on Bailey Island. Cedar Beach. This is the nicest beach on Bailey Island but with extremely difficult access for the public. Just a few nice houses get to enjoy the easy access; for everyone else it is a struggle. Take Robin Hood Road east off Route 24 and follow to the juncture of Robin Hood Road and Cedar Beach Road. At this point you need to park your auto on the right hand side of the road before the juncture and then walk walk down Cedar Beach Road to get to a small marked path that will take you to the beach. Casco Bay Lines Nature Cruise. Takes place at noon-time. Runs from end of July to Labor Day. From I-285 take the Topsham exit. Continue on to Route 1. Take the first exit at Cooks Corner. Take Route 24 South. It is about 13 miles to Bailey Island. You will pass over Great Island and Orr's Island. Aerial View of Bailey's Island. Taken from a remotely radio-controlled plane. The view was filmed in the summer of 2013; altitude is at various levels up to 2,000 feet. Flight starts from Stover Point, Harpswell, ME. "Bold Oceanfront with Breathtaking Views"
A fantastic little cabin with very private location feet from the rocky shore of Bailey Island. Very neat and newly renovated. Perfect for a quiet getaway trip for a couple. 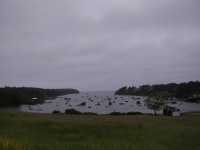 Fantastic view of Little Harbor on the east coast of Bailey Island. Has a restaurant. No alcohol served; bring your own booze (BYOB). Within walking distance of the Giant's Stairs Trail. This appears to be a nice hotel. Very woodsy with moose heads all around the interior. There is a small bar and restaurant (guest only). Rooms appear to be very nice but are pricy. This restaurant is located at the northern tip of Bailey Island. Great views, good service, lots of seating, great menu, sells alcohol, but is a little pricy. Bailey Island: Memories, Pictures and Lore by Nancy Orr Johnson Jensen. Mayhaven Publishing, Mahomet, IL, 2003.
one-week vacation to Bailey Island and the Harpswell Penisular and Islands.